Yesterday, I posted about the details that can emerge if you focus on what is around (or specifically, below) the art on the walls. Here are some more examples of the tiny stories told by the tiny details and embellishments on the fireplaces sprinkled throughout the museum. 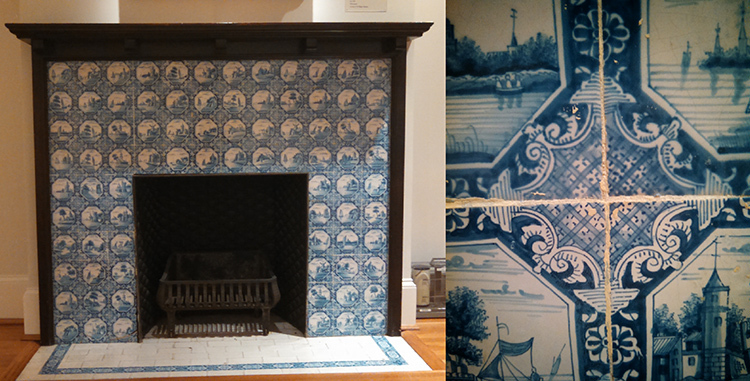 Over eighty ornate blue and white tiles depict scenes of castles, ships, and farmers. Each tile is different from its neighbor, showing the artistry of this work on a fireplace in an upstairs room of the original Phillips house. Is that a face hidden in the East Parlor fireplace andiron, or just an artful arrangement of leaves? 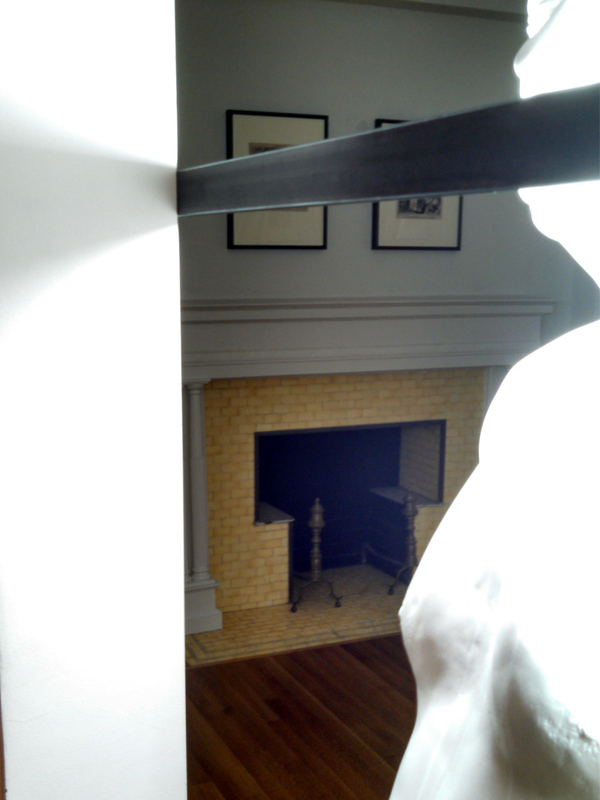 Bernardi Roig’s An Illuminated Head for Blinky P. (The Gun) cuts off a bright yellow fireplace from closer observation. 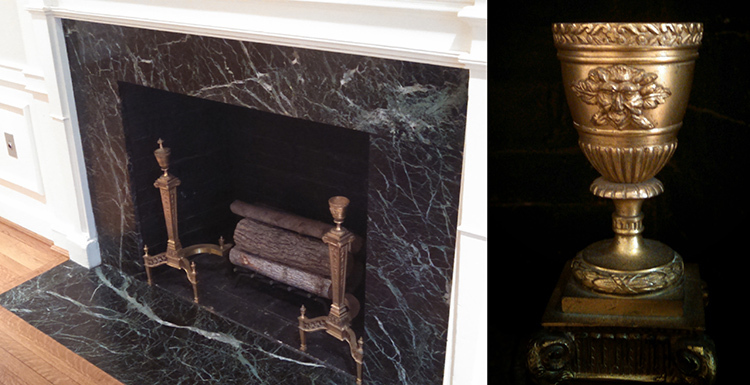 What other artworks, and what other shoes, have come and gone before this yellow brick fireplace? 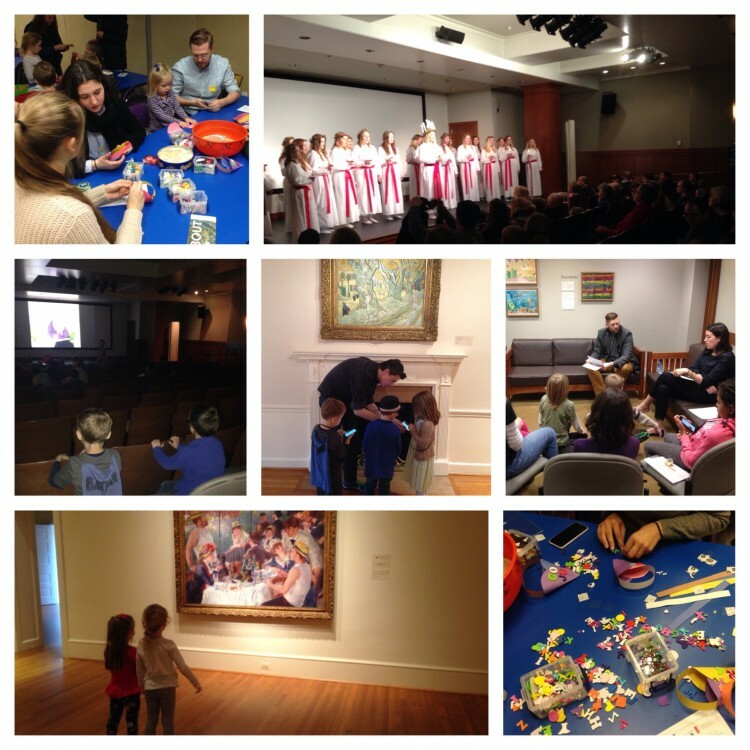 As a part of our Nordic Cultural Initiative, the Phillips recently hosted our first Nordic Wonderland family program in collaboration with the embassies of Denmark, Finland, Iceland, Norway, and Sweden. Over 120 guests created art activities from Denmark and Norway, experienced storytelling from Iceland, viewed a Moomin cartoon from Finland, and watched a St. Lucia parade from Sweden. During the program, we debuted our new Winter Warm Up “Art-Venture.” The digital scavenger hunt is a fun way to navigate the Phillips. You can play with your family, friends, or even by yourself! The Winter Warm Up “Art-Venture” is available to visitors all season long and can be accessed using your mobile device, or you can access it here: http://edventurebuilder.com/phillips/winter. This weekend, the Phillips is hosting a Nordic Wonderland family program in collaboration with the embassies of Denmark, Finland, Iceland, Norway, and Sweden. To help us get ready for the celebration, we asked staff to share important Nordic winter traditions from their countries. Read Part 1 here and learn about traditions in Denmark, Iceland and Finland. Snow fun and ice swimming in Finland. It is the end of one year, the beginning of another, and usually also the beginning of the proper winter. It is the time to relax, be with family and enjoy outdoor activities like skiing, skating, or playing ice hockey, after which it is a perfect time to enjoy a cup of hot chocolate by the fire. 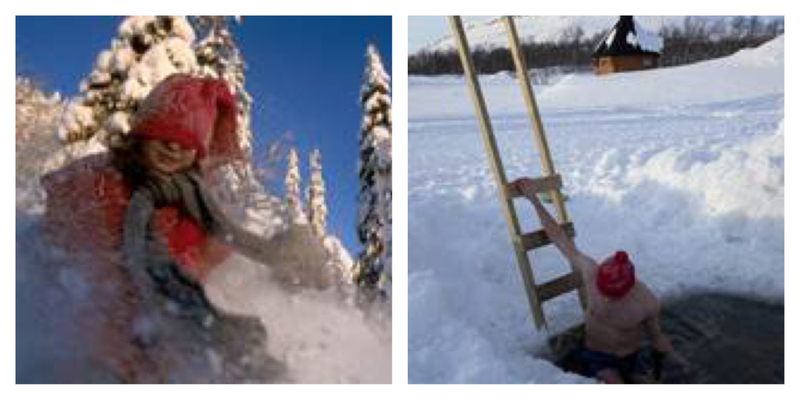 For those brave enough, try one of the favorite activities of Finns in the winter: there are around 180,000 lakes in Finland, and we use them in the wintertime simply by making a hole in the ice for winter swimming. At first, winter swimming can sound crazy (even scary!) but combine a warm sauna with the dip and you will experience relaxation beyond your dreams. Trust us Finns, take a chance. In the morning of December 24, Joulupukki (Santa Claus) starts his journey from Korvatunturi and brings presents for children. He must visit every home in one evening so logistically it’s quite a challenge but he knows how to do it. Santa spends a little time in every household and enjoys some gingerbread cookies before continuing his journey. Fireworks are an integral part of the New Year’s celebration, but the best firework display one could have is seeing the Milky Way above you in a crisp January night. Traditions also include predicting the future from tin figures which you make yourself by heating tin and pouring them in cold water. What will 2015 have store for you? We hope everyone has a beautiful Christmas and a happy new year. Or as we Finns would say, Hyvää Joulua ja Onnellista Uutta vuotta! The Santa Lucia celebration on December 13 is one of Sweden’s most cherished cultural traditions. Legend claims that Lucia was a mythical figure with the role of light bearer in the dark Swedish winters. In the old almanac, Lucia Night was the longest of the year. The Santa Lucia procession is a line of girls and boys in white gowns singing Christmas carols. The boys are usually dressed as tomtar (Santas) or stjärngossar (star boys); girls are tärnor (Lucia’s handmaidens). 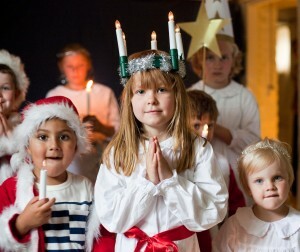 Each year in every town and village around the country a Lucia is selected, and there is even a National Lucia in Sweden. The Lucia celebrations are enjoyed with Swedish holiday delicacies like pepparkakor (ginger snaps) and lussekatter (saffron buns) that are usually accompanied by glögg (hot mulled wine) or coffee.